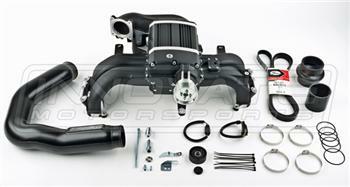 Innovate Twin-Screw Supercharger System - Dezod Motorsports Inc - Home of the automotive performance enthusiast since 2002. Innovate Motorsports has announced the release of their high performance twin screw supercharger system for Scion FR-S, Subaru BRZ and Toyota 86 vehicles. The all new system includes Innovate’s proprietary twin screw supercharger, high performance aluminum intake manifold, molded intake tubing and all necessary hardware. Bolt-on installation can be completed in as little as 4 hours with simple hand tools. During the design, extra attention was given to make the system install like original equipment by including features such as specially constructed wiring extension harnesses that plug-in into factory connectors, pre-cut vacuum hoses, black powder coating, and a pre-assembled “bolt on and go” supercharger intake manifold assembly. In addition, the OEM air box and MAF sensor location are retained to maintain OEM driving characteristics. Incredible low and midrange torque gains. Eliminates the large “torque dip” experienced with the production 2.0L engine. STAGE 1 “TUNER” System (Non-Intercooled) – This supercharger system includes all the required hardware needed for the installation (Minus the tools). “Tuner” indicates that this system does not include any ECU re-flashing tools or calibration file. You will need to consult a highly experienced EcuTek tuner prior to installing the system. Failure to do so will result in engine failure. “Tuner” systems do not qualify for C.A.R.B. approval. STAGE 1 “COMPLETE” C.A.R.B. APPROVED (E.O # D-719) System w/ECUTEK ProECU Re-Flashing Cable & Tune File, & K&N™ drop-in filter! – Non-Intercooled. The “COMPLETE” system includes all the required hardware & ECU calibration needed for the complete installation, minus the tools. STAGE 2 “TUNER” Intercooled System – This intercooled supercharger system includes all the required hardware needed for the installation (Minus the tools). “Tuner” indicates that this system does not include any ECU re-flashing tools or calibration file. You will need to consult a highly experienced EcuTek tuner prior to installing the system. Failure to do so will result in engine failure. “Tuner” systems do not qualify for C.A.R.B. approval. STAGE 2 “COMPLETE” Intercooled System, C.A.R.B. APPROVED (E.O # D-719) w/ECUTEK ProECU Re-Flashing Cable & Tune File, & K&N™ drop-in filter! – Intercooled. The “COMPLETE” system includes all the required hardware & ECU calibration needed for the complete installation, minus the tools. INTERCOOLER UPGRADE KIT (STAGE 1 to STAGE 2) – Contains Laminova Intercooler Core, Front Mounted Heat Exchanger w/brackets, Bosch OE Fluid Pump w/Plug & Play Harness, Fluid Reservoir, Molded Hoses, and other necessary parts needed for installation.